Editor’s Note: “Hamilton” has recently swept Broadway ticket sales, taken over theWhite House for a day and ushered in a new discussion about the intersection of theater, race and history. But it’s also become a presence in classrooms for teachers like Brian Mooney, who explains below how the musical can help students learn. Just mention the name “Donald Trump” in my classroom and you’ll see what happens: a barrage of profanity-laden mumbles from my school’s predominately Latino student population. Our high school, one of the most diverse in all of New Jersey, is located in Hudson County, home to the greatest number of immigrants in the entire state. Many of our students have parents who’ve emigrated to the United States from places like Cuba, Colombia and the Dominican Republic. Mention a different name in my classroom, however — a name no one could have guessed would be so relevant in 2016 — and watch as students start mouthing the words to every single lyric of the 46-track cast album with an enthusiasm that could only be described as obsessive. The name is, of course, Alexander Hamilton, the first Treasury Secretary of the United States, the “10 dollar founding father,” and the subject of what has been called Broadway’s hottest new musical. It is possible to teach “Hamilton” even if you haven’t seen the show. The cast album includes recordings of the entire production, and because of its lyrical density, it is ripe for literary exploration, making it just as relevant for the language arts classroom as it is for a history or musical theater curriculum. When I first listened to the cast album in its entirety, I immediately picked up on the pro-immigration themes in lines like, “immigrants / we get the job done!” Throughout 46 songs, listeners are reminded again and again that Alexander Hamilton is an immigrant from the Caribbean. But why does this matter? And why are kids so invested in it? One evening, around the same time I listened to the cast album, I tuned in to a presidential debate on a major news network. As one candidate proposed his plans to build a wall on our border with Mexico and deport 11 million undocumented immigrants, the connections started forging themselves. I wondered, could it be possible that “Hamilton” resonates with young people in part because of the xenophobic, anti-immigrant rhetoric that has come to define this round of political discourse? I kept thinking about my Latino/a students and their very negative, visceral responses to anything associated with Donald Trump. While most adults dismissed Trump in the early stages of his campaign, many teenagers were paralyzed by fear, imagining scenarios that included loved ones, even themselves, being torn from their homes, shackled and deported. Most adults, likely including Trump himself, might understand these threats make for good headlines but are ultimately unfounded. Many of my students, though, have been affected in a very real way by the language of politicians who have consequently traumatized young people with the rhetoric of hate, intolerance and bigotry. This is the backdrop that informed my decision to spend six weeks this spring teaching “Hamilton” in its entirety. “Hamilton” is what creator Lin-Manuel Miranda calls a “hip-hop story,” but in order to understand what that means, it is necessary to know at least some of the history of hip-hop itself, too. In one lesson, students considered the parallels between Alexander Hamilton and DJ Kool Herc, a Jamaican immigrant who is considered the godfather of hip-hop. This unlikely parallel highlights the contributions that non-European immigrants have made to the cultural fabric of our nation’s history. It is essential to discuss with students the significance of the musical’s cast, which consists almost entirely of people of color. The imagery of black and Latino actors dressed in traditional 18th-century attire visually re-positions those who have historically been silenced and marginalized into positions of voice and power. While this is a compelling aspect of “Hamilton,” it’s also crucial to acknowledge how the musicallargely ignores the historical presence of people of color during the revolutionary era. There are some video clips available, like the cast’s performance at the 2016 Grammys, that present students with imagery to spark a conversation about why the racial identities of the actors are important. As I began to think about the final project, I wanted students to understand that they are a fundamental part of this nation’s past, present and future. The project, titled, “Hamilton: The Immigrant. An Ethnographic Hip-Hop Project,” asks students to become ethnographic researchers. Ethnography is the study of cultural groups, and what better cultural groups for students to study than the immigrant populations from which they and their families come? The idea is for students, working in small groups, to research an immigrant population by pulling from scholarly research on the Internet and collecting personal histories from interviews with relatives. After conducting this research and submitting a portfolio with several artifacts, students will collaborate on a creative presentation in which they must present their research using the multi-modal elements of hip-hop culture (rap, spoken word, DJ, break dance, graffiti art). 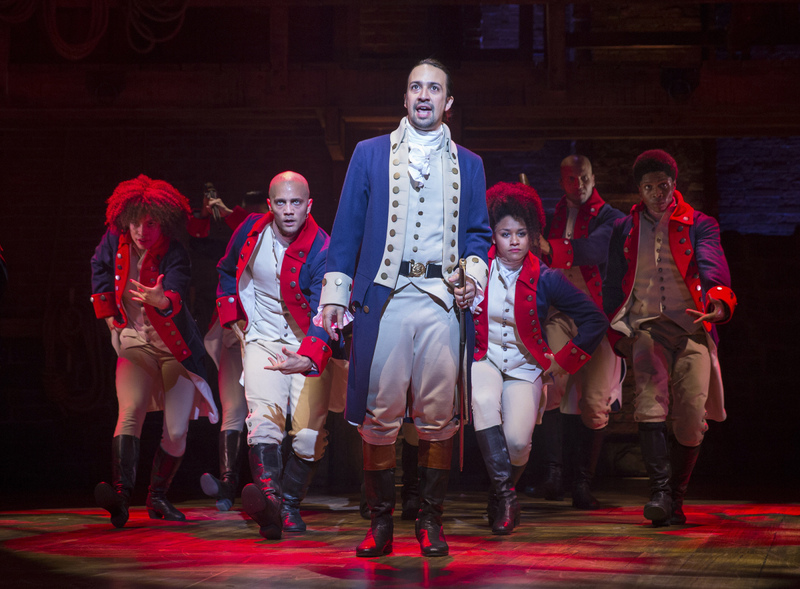 Ultimately, students must accomplish what Miranda did when writing “Hamilton”: tell a story about immigration, identity and legacy using hip-hop as the medium. It would have been easy to have students analyze primary source documents and then demonstrate their understanding by writing a rap. That might have been fun, creative, and academically rigorous, but for me it would fall short of what’s possible when we think about the musical’s potential to engage a diverse population of students from immigrant backgrounds. Because of our students’ cultural identities, their responses to Donald Trump and the pro-immigration message of “Hamilton,” I decided to create a project that would synthesize these ideas in ways that are culturally responsive while reaching far beyond the scope of Broadway and this year’s presidential race. When students take history into their own hands, they begin to see themselves as agents of change, responsible for challenging and rewriting the narratives that have excluded them in the past. Brian Mooney is an educator, scholar, and author who teaches high school English in New Jersey. He is also a doctoral student at Teachers College, Columbia University. In June 2015, Mooney’s work inspired a school visit by generational icon and Grammy award-winning hip-hop artist Kendrick Lamar. His first book, “Breakbeat Pedagogy: Hip-Hop and Spoken Word Beyond the Classroom Walls,” comes out in Fall 2016 from Peter Lang Publishing. Hi! I was wondering if you would be open to sharing your lesson plans on this? My students are learning Hamilton right now but there is so much more I’d love to dive into. Thanks!